Garrett McGrath has 25 years of experience as a top network marketing professional. Mr. McGrath was elected President of the Association of Network Marketing Professionals (ANMP) in 2012 and is a highly sought-after keynote speaker, leadership trainer and team-builder. Mr. McGrath has built organizations in excess of 100,000+ distributors in 21 countries worldwide, together with his wife and business partner, Sylvia, and has served as Master Distributor for four network marketing companies over the past 20+ years. Sylvia McGrath has 25 years of marketing experience, including having served on the corporate side as Vice President of Marketing for a network marketing company and Vice President of Sales & Marketing for a design firm with Fortune 500 clientele. 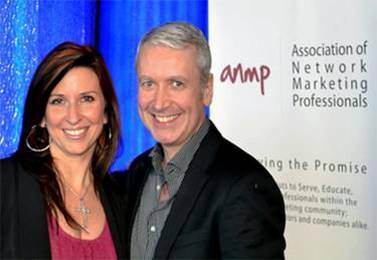 With 42 years combined experience in Network Marketing, the McGraths have worked side-by-side since 1999 and together provide unique leadership training, coaching and personal development to network marketing professionals through an original series of international daily live broadcasts, live events, videos, mentorship, tools and training systems. The McGraths have also produced numerous videos, CDs, guidebooks and marketing tools for large network marketing organizations. The McGraths have written, filmed and produced numerous articles and tools for the Network Marketing profession, and have been featured in numerous publications. Garrett and Sylvia also serve on the Editorial Review Board of the premier newsstand magazine publication for Network Marketing, Networking Times.